It wasn’t so long ago that almost every magazine chased ever larger circulation, even if it meant losing money in the process. It worked because print-ad sales paid the bills — and then some. Now that magazines seem unlikely to recapture the print-ad revenue they enjoyed before this recession, however, their other revenue sources are taking on new importance. Happily for the industry, it’s getting easier to find publishers that have built or begun real businesses beyond selling ad pages. Unhappily, however, it’s still not easy. Ad Age surveyed five magazine brands, big and small, whose revenue mixes suggest models that may become much more common. Print ad revenue ranges from as little as 3% for O’Reilley’s Make magazine, to a high of 45% at Fader. 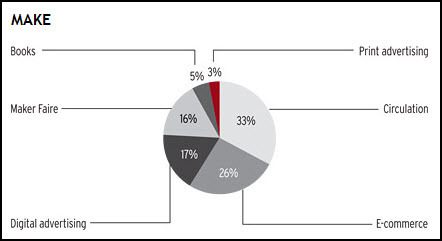 When circulation revenue is added to print ad revenue, Make is still the winner, with only 36% of it’s revenue coming from these two key traditional sources. All -in-all, an inspiring article. The obvious question to ask here is: what will become of all the books in the building? There are probably thousands of them! Are they all just going to have to get thrown away? Or microwaved!? For answers, The Observerturned to a couple of bedbug experts: entomologist Louis Sorkin from the American Museum of Natural History and Jennifer Erdogan, the director of bedbug control services at New Jersey-based Bell Environmental Services. 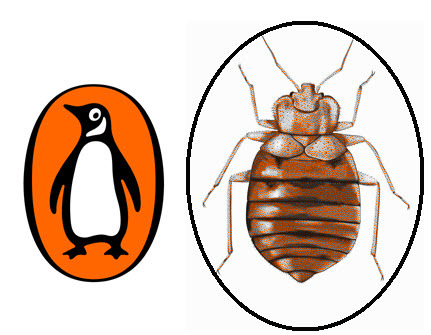 Neither expert felt it very likely that the bedbugs would get into the books — “They don’t necessarily like books, especially,” said Mr. Sorkin — but it is a possibility. Should journalists and book critics be worried about opening Penguin packages in the next couple of days? Not really, but maybe, according to Ms. Erdogan. Once again it’s a record quarter. But keep in mind (as I’ve pointed out many times before) that annualized this would total about $150 million of a $35 billion US book industry. Let’s cheer them on. 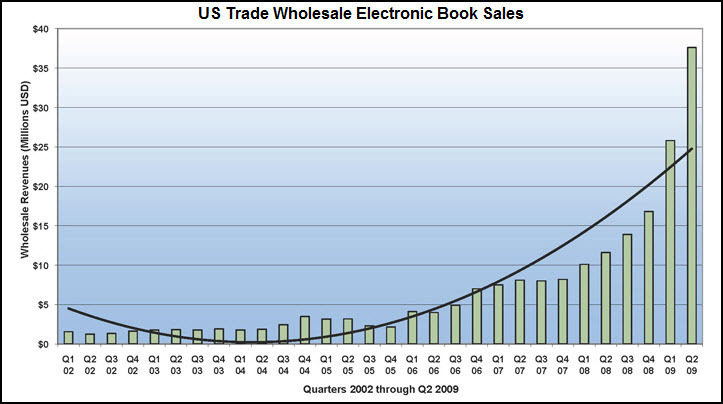 The sales are exploding. Let’s stop the cheering as we keep our perspective. Do please go to the IDPF website and consider their provisos regarding this data. They are important considerations. But small percentages tell their own story; and optimists sleep well. I would imagine that the title of this blog entry will strike you as about as contradictory a title to yesterday’s entry as would be possible. But it’s pulled from the précis (registration required) of a new report from Borrell Associates, which has a strong reputation analysing all thngs Web. I thought I would rebalance my karma after yesterday’s posting. So here are our latest projections: Newspapers will be down this year, then they’ll start going back up. We expect a 2.4% rebound in newspaper advertising in 2010, and continued single-digit increases over the next several years. 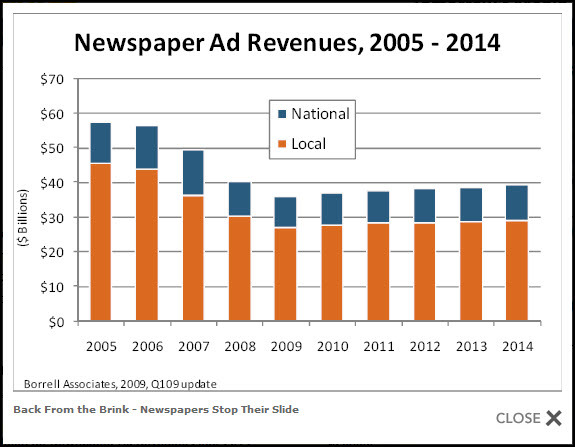 By 2014, newspaper ad revenues will be up about 8.7% over 2009 levels. While national newspaper advertising will do just fine, we foresee the greatest growth in local print – going from $8.9 billion this year to $10.1 billion, a 13.4% increase. True, it all equates to more of a dead-cat bounce than anything else. And even at 2014 levels of just under $30 billion, newspaper advertising won’t be anything near the $55 billion we saw earlier this decade. Nor will it ever return to that level. The latest mediamorphosis of newspapers is almost complete. This once-fat, gray caterpillar that we knew as the “major daily newspaper” is turning into a smaller, more delicate, colorful local magazine, with fair prospects for growth. The smaller newspapers are firmly entrenched in their niche of providing rich local content that people seem to prefer in print – rather than screen – format. Our local newspaper, the Virginia Gazette in Williamsburg, is actually growing circulation and is thick with advertising supplements. We may be dead wrong. The entire industry might die, and scores of papers might go belly-up over the next year. I’d like you to mark your calendar for today’s date, 2010, and see if that’s the case, or if we wound up being right.